Peter Walsh, New Iberia Research Center: "We’re going to do vaccine trials on captive chimpanzees in order to save the ones in the wild. That's the trade-off ... It’s a messy world, you know? That's just the way it is. If I could do it without doing the captive trials, I would do it. But I can't." For six years, Hercules and Leo have endured experiments like having electrodes inserted into their muscles so that researchers at Stony Brook University can study the way they walk. This week brought an end to the use of chimpanzees in vivisection that's for the benefit of humans. A new government ruling puts all chimpanzees, no longer just chimps in the wild, under the protection of the Endangered Species Act. And this means they can no longer be used in biomedical research. Hercules and Leo are two of the chimpanzees who have come to public attention since the Nonhuman Rights Project (NhRP) filed suits on their behalf to have them released from unlawful detention. Their case is currently working its way through the legal system of New York State. But regardless of the outcome, the experiments involving these two chimpanzees, now eight years old, are over. So, is all experimentation on chimpanzees finally over? Not quite. There's one proviso in the ruling: Laboratories can apply for a permit for research that's for the benefit of chimpanzees, rather than humans, and is for the purpose of "providing enhancement to the propagation or survival of the species by providing a conservation benefit to species in the wild." 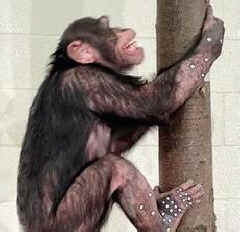 We’re going to do vaccine trials on captive chimpanzees in order to save the ones in the wild. That's the trade-off ... It’s a messy world, you know? That's just the way it is. If I could do it without doing the captive trials, I would do it. But I can't. Yes you can, says Brian Hare, a professor of evolutionary anthropology at Duke University, who works with great apes in Central Africa. Hare says vaccine experiments can and should be conducted at ape sanctuaries in Africa, where the animals live in relative freedom. He says New Iberia's plan is basically a ploy to keep research programs going by saying they're for the benefit of chimpanzees. I think they are just taking advantage of a bad situation in Africa to continue to get funds that they desperately need to pay for infrastructure at their essentially arcane laboratories. New Iberia hasn't actually applied for a permit to do this kind of vivisection, so it would seem that inviting in the media and talking about how it can benefit chimpanzees is a trial balloon to see whether it's worth pursuing a permit. Earlier this year, as the NhRP's lawsuit was about to be heard in court and the government's new rules were soon to take effect, Stony Brook University decided to pre-empt the ruling and shut down the experiments on Hercules and Leo. So the question now is how and where the two chimpanzees, who have known nothing beyond the bars of a laboratory, will spend the rest of their lives. Stony Brook itself doesn't own the two youngsters. They've been on loan from New Iberia, which says it wants to send them to a sanctuary. But New Iberia hasn't generally shown itself to care much about the care and welfare of chimpanzees. In 2009, investigators from the Humane Society of the U.S. went undercover at their laboratory, capturing horrific video of chimpanzees and monkeys in tiny cages, suffering severe distress and engaging in self-mutilation. Looking after captive chimpanzees is also expensive, and even projects like trying out an Ebola virus won't remotely cover the costs of holding on to 230 chimps. Earlier this year, another laboratory, the Yerkes National Primate Facility at Emory University, announced plans to "donate" eight chimpanzees to an unaccredited wildlife park in the U.K.
New Iberia says it's planning to send Hercules and Leo to a sanctuary, but has not said which one. Meanwhile, the Nonhuman Rights Project, whose lawsuit on behalf of Hercules and Leo is working its way through the legal system in New York State, is insisting that these two chimps go to an accredited sanctuary that's part of the North American Primate Sanctuary Alliance. NhRP President Steven M. Wise says the organization will take legal steps to prevent Stony Brook or New Iberia attempts from moving these chimpanzees anywhere else. If Stony Brook attempts to move Hercules and Leo to any other place, we will immediately seek a preliminary injunction to prevent this move pending the outcome of [our legal] appeals. Hercules and Leo remain at the laboratory at Stony Brook, but a resolution of their situation is expected quite soon.